I didn't actually expect anything to come up when I googled "Cauliflower Pasta". I've never had cauliflower in pasta before nor have I ever even seen cauliflower pasta, but I was grasping for straws trying to come up with something to eat based on the ingredients we had on hand. 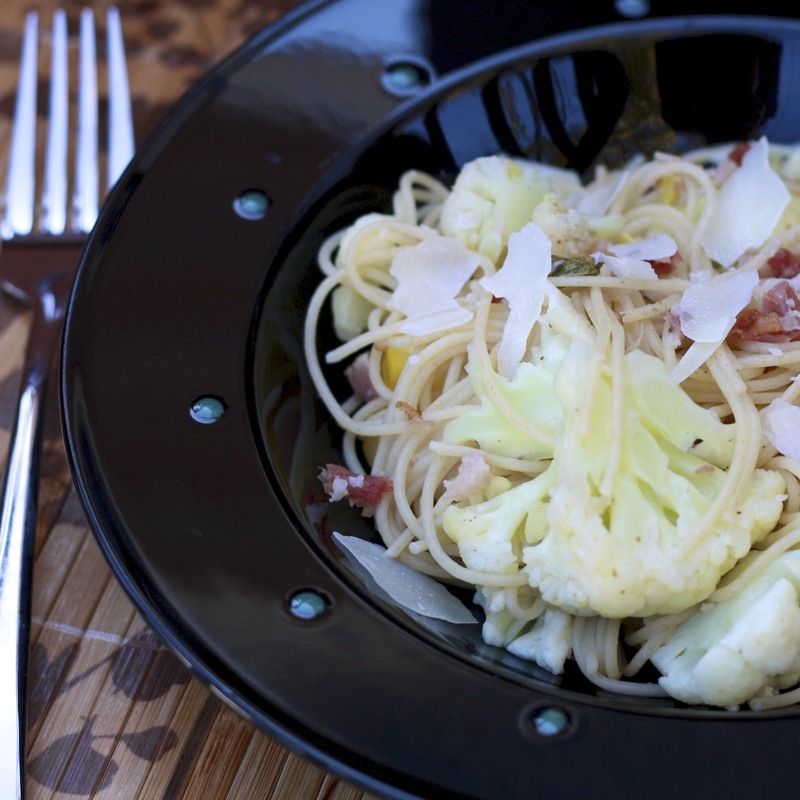 Real Simple magazine came to the rescue with this pasta recipe that came together in a flash. With only a handful of ingredients, I managed to have them all in my rather empty refrigerator and pantry. I was a little concerned it would be too boring of a dish, but Ryan and I both liked it. The best part was definitely the cheese, and I'm pretty sure I added more than the 3/4 cup it called for...I recommend you don't skimp either! 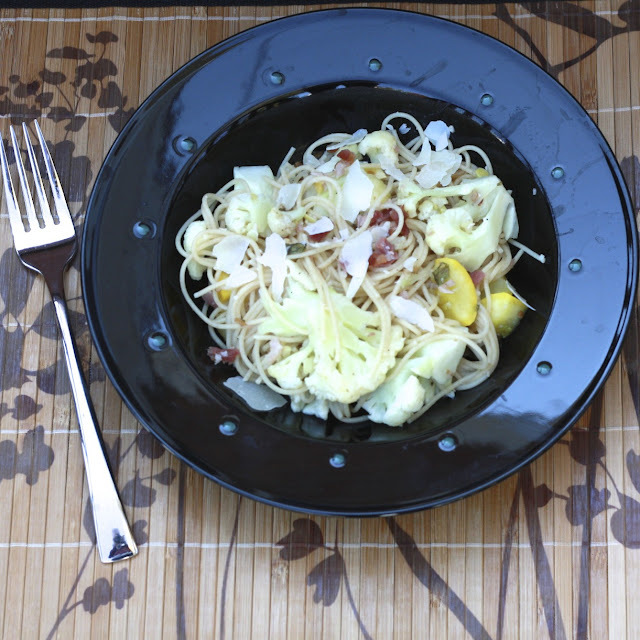 Note--You might notice something yellow in the pictures...I added some yellow squash I had on hand. I just sauteed it before adding the cauliflower. Feel free to bulk this up with your own veggie additions! 1. Cook the pasta according to package directions. Reserve 3/4 cup cooking water and drain. Return pasta to the pot. 2. Meanwhile, cook the bacon in a large skillet over medium-high heat until crisp, 6-8 minutes. Move bacon to a plate lined with a paper towel and crumble. 3. Add the sage to the bacon skillet and cook over medium heat, stirring once, until crisp (1-2 minutes). Remove from skillet and place with the bacon. 4. Add the cauliflower to the skillet with 1/4 cup water and 1/4 tsp each of salt and pepper. Cook, covered, for 5 minutes. 5. Uncover and cook, tossing frequently, until golden and tender (5 more minutes). 6. Add the reserved pasta water and 1/2 cup parmesan to the pasta, tossing until creamy. Add the cauliflower, sage, and bacon, tossing to combine. Sprinkle with remaining cheese.